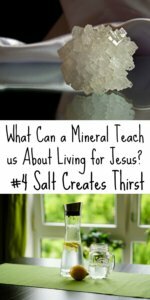 What Can a Lowly Mineral Teach us About Living for Jesus? Not long ago I went on a rigorous overnight hiking trip with friends. The September weather was sweltering and we spent two days drenched in sweat. On the steep trails, we stopped often to slake our thirst, and I remember one stop in particular. We had drained our water bottles and camel packs knowing that we were coming up to a spring where we could refill. By the time we arrived at the stream, which had dried to not much more than a trickle, we were parched. It seemed to take forever to filter enough water to drink our fill, but boy was it wonderful to finally gulp those cool mouthfuls of water. Thirst satisfied, we were energized – mentally and physically – to continue the long, hot hike. Thirst is surprisingly complicated, and we don’t yet understand all the mechanisms that create, and satiate, it. 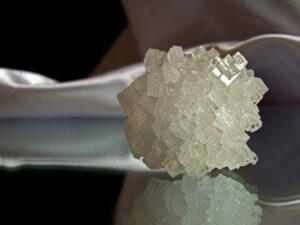 Part of the reason we get thirsty is because of the imbalance in sodium content of our cells. 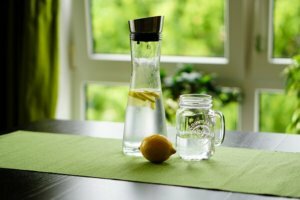 Water follows salt (like when your salt shaker clumps up during humid weather), and when fluid is pulled from ourselves through sweating, dehydration, or eating something with a high sodium content, we get thirsty. Thirst is our body’s way of prompting us to consume the water that we need to function healthily. If “you are the salt of the earth”, then your life will make others thirsty. We might make others thirsty for lots of things through the example of our lives. In every exchange, we, as the salt of the earth, have the capacity to create a thirst for something higher and holier. Your genuine patience with the lady who is digging out coins to pay her $4.33 bill in the checkout line will inspire others to cultivate the same kindness. Your joy in suffering will cause others to yearn to experience the same other-worldly joy that comes from security in Christ. Your example of honesty when it would be easier to mask the truth will cause others to thirst for the freedom that comes from such boldness. The relationship you share with Jesus, evidenced in your words, actions, attitudes, choices, has the power to be as salt, making others yearn for that life-giving, purifying, healing water that only comes through a relationship with Christ. Thirst is the Body’s way of reminding its members to drink deeply of the water of Life. What are you making others thirsty for? 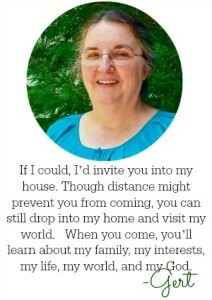 This guest post is written by Rae Schrock, Editor in Chief of Daughters of Promise Magazine. This article first appeared on the Daughters of Promise blog. The fourth in a series of four, it is used with permission. For more information about the magazine, click here.